Looking for something unique to do over the holidays? The upcoming Transformers Hair Show put on by Versace Entertainment and 2nd Glance Hair Studio is the perfect solution to boredom at this time of the year. Over 20 models will be strutting their stuff on a 20 foot runway on December 20, giving you the opportunity to take in the work of some of Bermuda’s most exciting stylists. There will be five hair fashion forward scenes to awe and amaze, aiming to give you ideas for your own hairstyle. 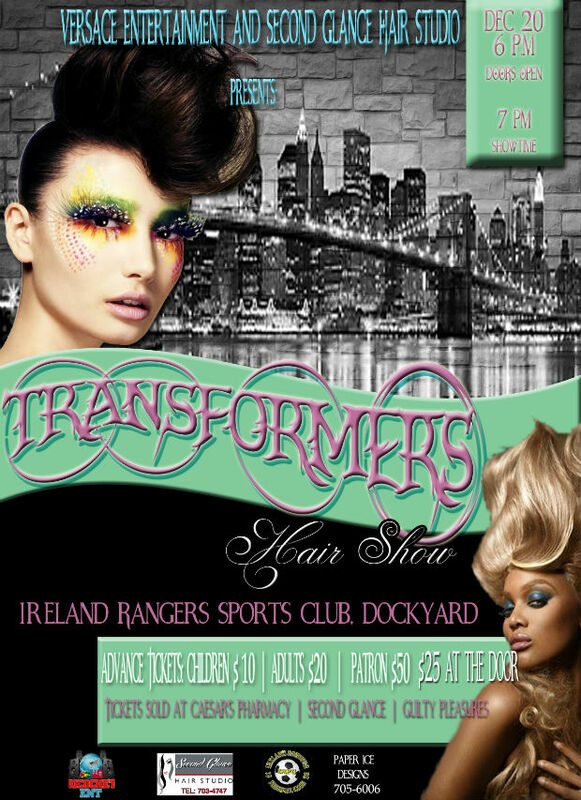 Sponsored by Ireland Rangers Football Club, Second Glance Hair Studio, Guilty Pleasures, and Paper Ice Designs, the Transformers Hair Show is set to be held at the Ireland Rangers Club at Dockyard under a large tent complete with warming lamps, on December 20, with the doors opening at 6.00pm and the show beginning at 7.00pm. Tickets are currently available at Guilty Pleasures, Caesar’s Pharmacy, and Second Glance Hair Studio at a price of $20 for adults and $10 for children, with a price of $25 set for those who purchase at the door.